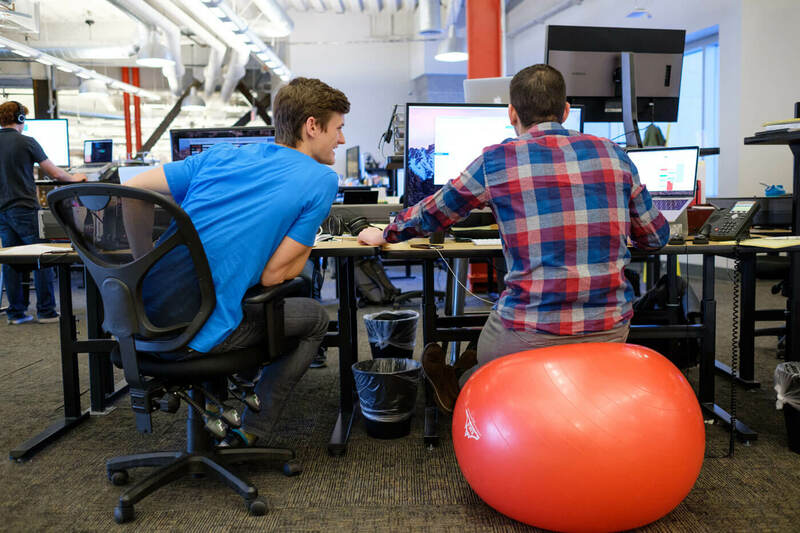 The Qualtrics XM platform is software for improving the experiences organizations provide to every stakeholder, whether customers, employees, prospects, users, partners, suppliers, citizens, students, or investors. The Research-Services-Sales team focuses on the first step – helping clients design and implement research programs that inform key business decisions. 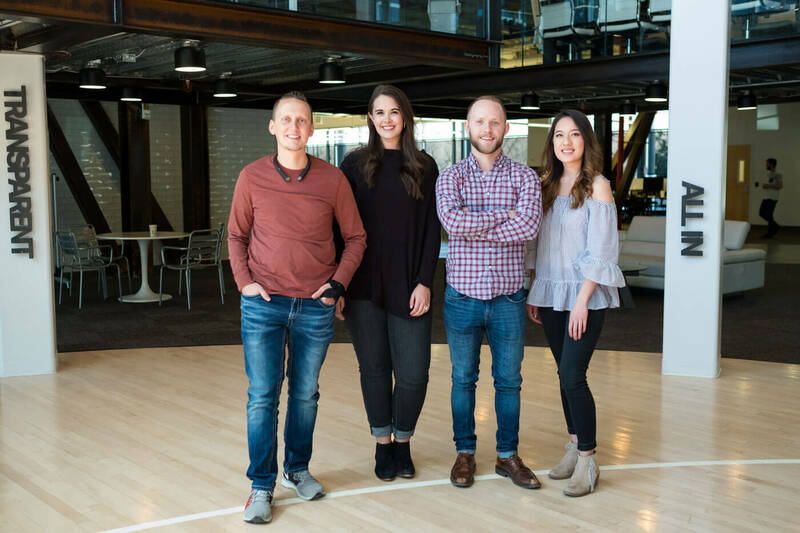 To learn more about how the team — the fastest-growing at Qualtrics — collaborates, measures success, and makes an impact, we talked with Dan Watkins (Head of Research-Services-Sales), Nancy Le and Ashton Schumpert (Account Executives), and Garrett Dorman (Senior Account Manager). Interested? 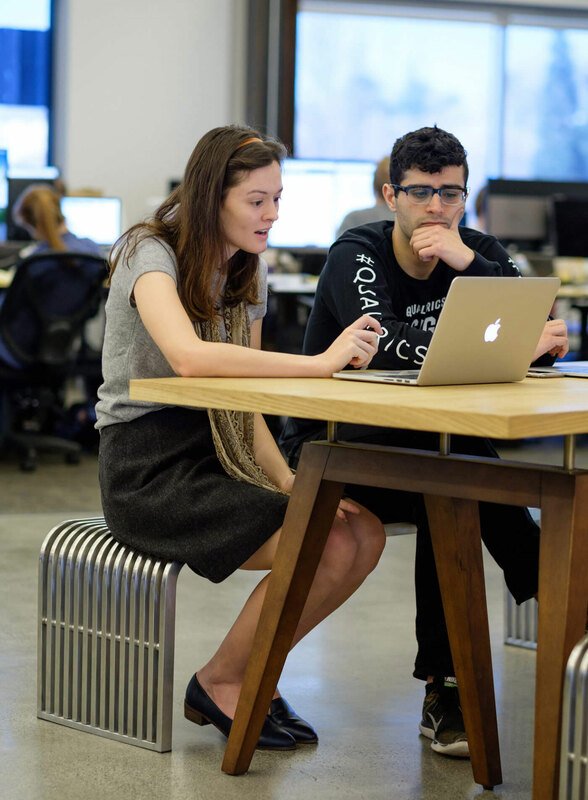 See open roles to learn more. 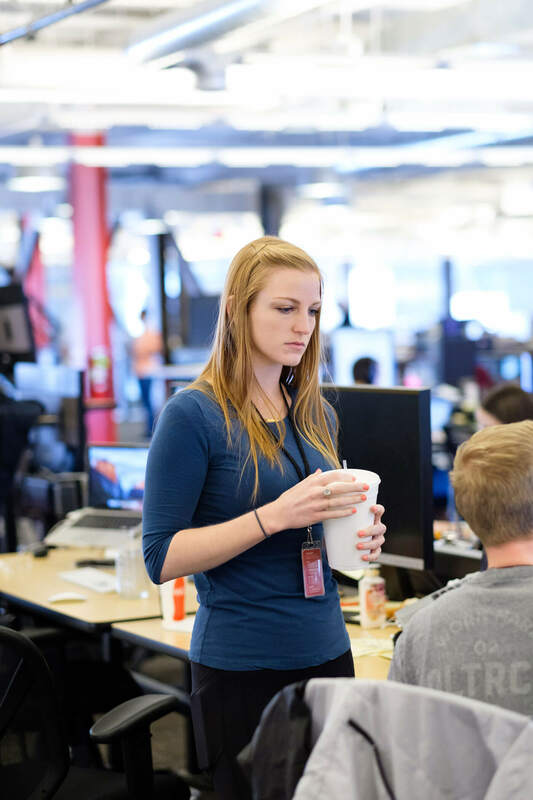 Give us the basics: What does Qualtrics do and how does the Research-Services-team help? 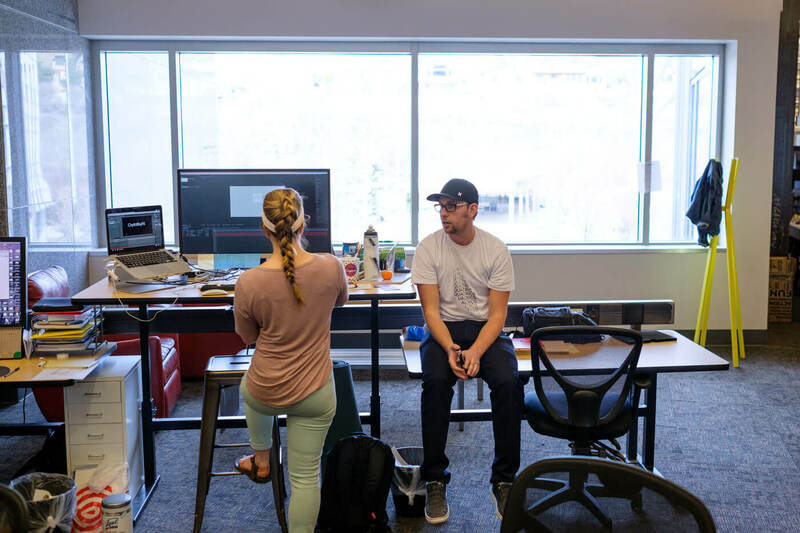 Dan: Qualtrics provides Experience Management software that helps companies bridge the gap between what they think is going on with their customers, brands, products, and employees vs the reality. It’s an extremely flexible platform, which means that individual clients can use it in a lot of different ways. After a client launches Qualtrics XM, Research-Services-helps them take the next step and expand how they use our technology. We dig into the kinds of research they want to do, the experiences they need to measure, and then work with partners all over the world to meet those needs. Garrett: The primary goal of the Research-Services-Team is helping Qualtrics evolve from a mostly DIY platform to a full-scope service. 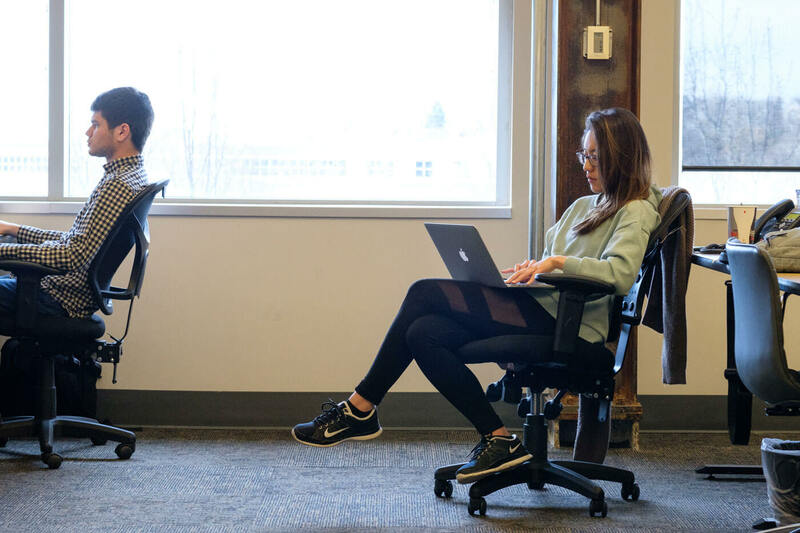 We work to discover the gaps within a user’s research experience and fill their needs with our services, including survey design and programming, fielding responses, and packaging the insights. Ashton: We’re helping each of them balance different needs, user bases, and costs. Our goal is to optimize the work of the Sales team and make sure clients get as much as possible out of their research projects. We spend a lot of our day reaching out to clients and talking about their goals. 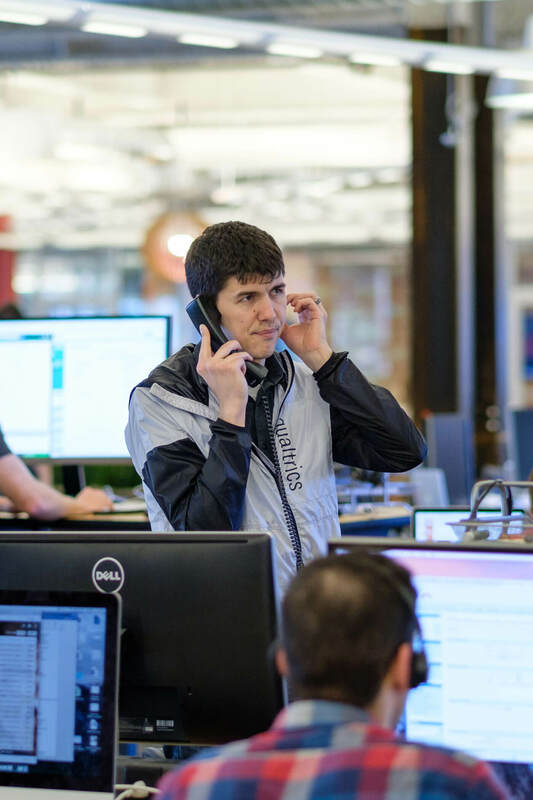 We’re prospecting, but it’s within the existing client base; we’re building on solid relationships rather than making calls for calls’ sake. Can you tell us about some of the projects the team has worked on? Dan: Sure. I’ve been at Qualtrics 10 years now, and I remember one study we did not long after Barack Obama was elected president. He’d promised to decrease cigarette consumption and cases of lung cancer in the U.S., and a key federal government agency was in charge of the research for that effort. 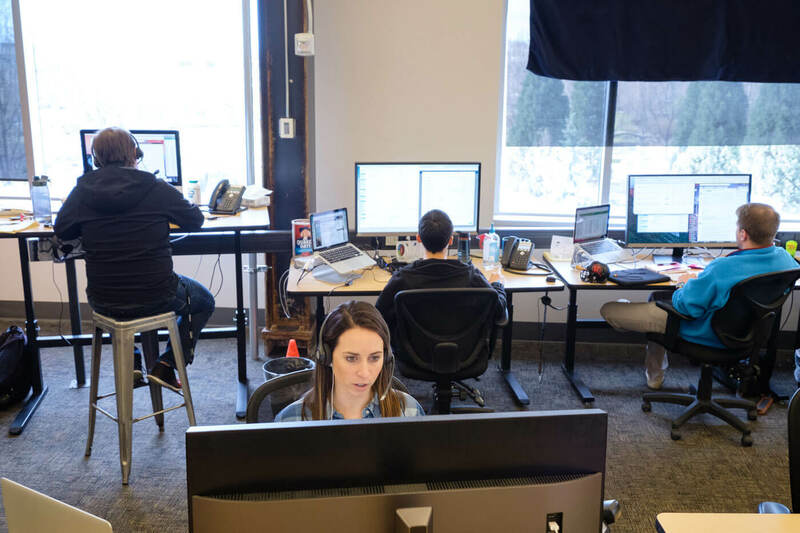 Most of the sample collection they needed was done on the Qualtrics platform through the Research-Services-team, and then that data was used to design anti-smoking ads to target key audiences. And it worked! Smoking rates decreased significantly. That’s something I’m proud of: fewer cigarettes are consumed in America, in part because of Qualtrics and my team. Another project that made a big difference was for JetBlue. They’d been ranked highest for customer satisfaction by J.D. Power and Associates for 10 years in a row, but they weren’t sure that truly reflected how their customers felt. So they asked us to develop a more targeted assessment. We surveyed hundreds of people that flew on JetBlue and their competing airlines, and then compared the feedback. And we learned a ton. For example, JetBlue realized a lot of their customers flying out of smaller airports were upset because those locations had no stores or restaurants open early in the morning. So they started offering free coffee — and that, of all things, improved customer loyalty. 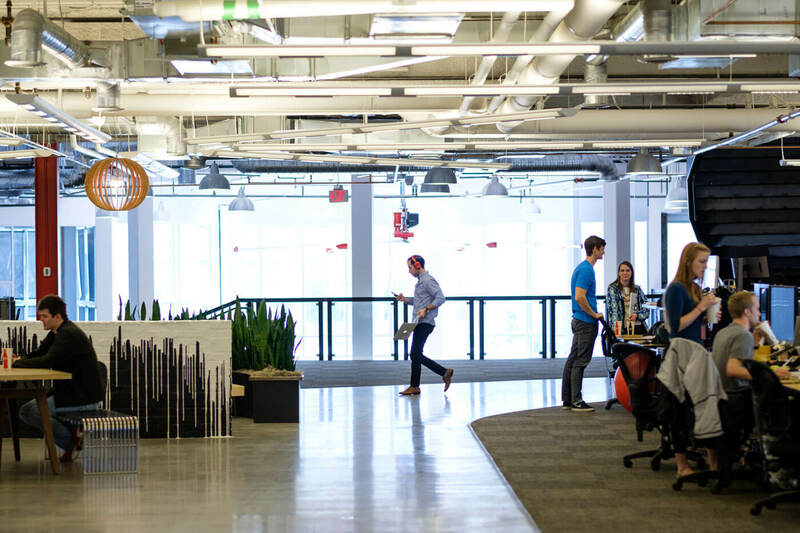 Above and below: Open workspaces allow for easy collaboration among teams. Corner office? More like corner conference room with gorgeous mountain views. 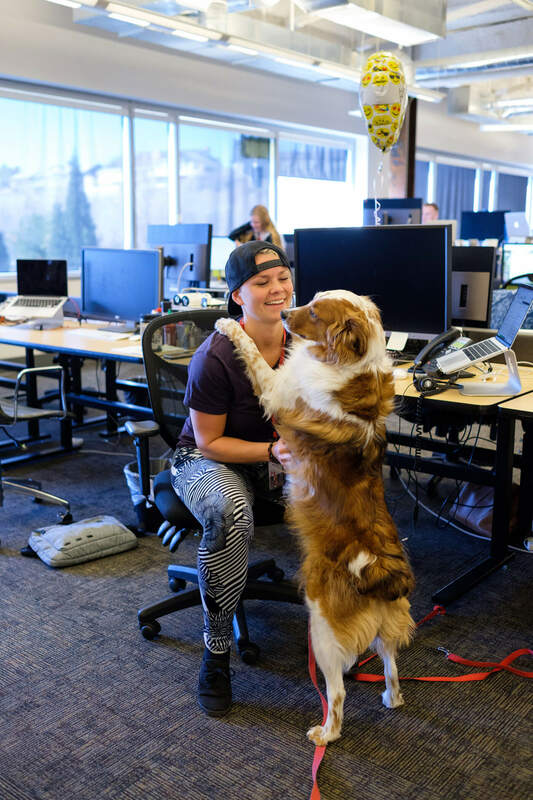 What were you doing before Qualtrics, and what brought you here? Nancy: I graduated recently, in May 2016. 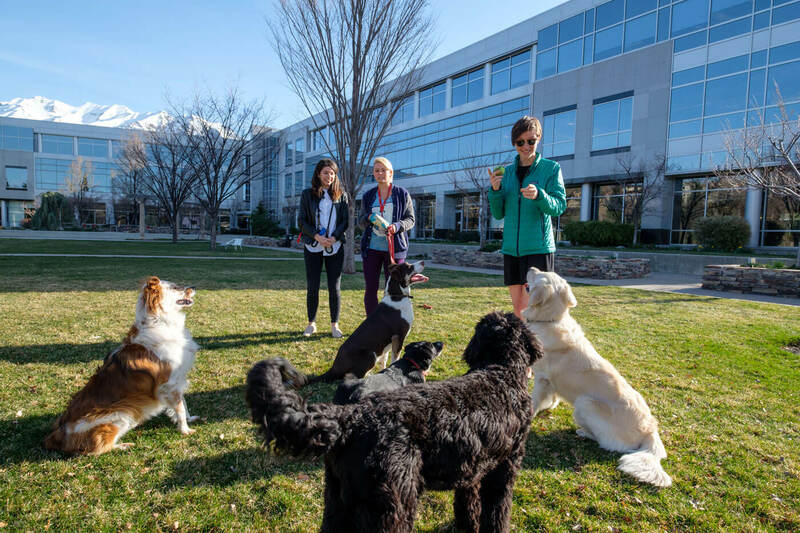 I’d used Qualtrics in both of my majors — marketing and psychology — so I understood from my lab work how this team can make research so much faster and easier. 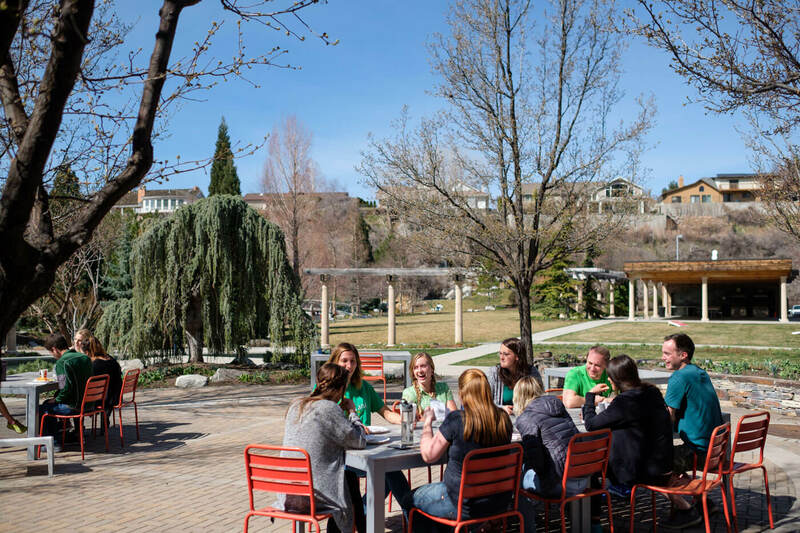 I’d never thought before about moving to Utah, but I accepted the job before they even flew me out; I was that confident I wouldn’t change my mind. And I was right. This is a great team to work on, and we’re making differences in the lives of researchers everywhere. I also ended up really liking Utah. I wasn’t the biggest outdoor person before I came here, but I was floating down a river and biking within a week of moving. My teammates even convinced me to go camping. Garrett: I came straight from college, too. I studied Neuroscience at Brigham Young University and did some research at Cambridge. 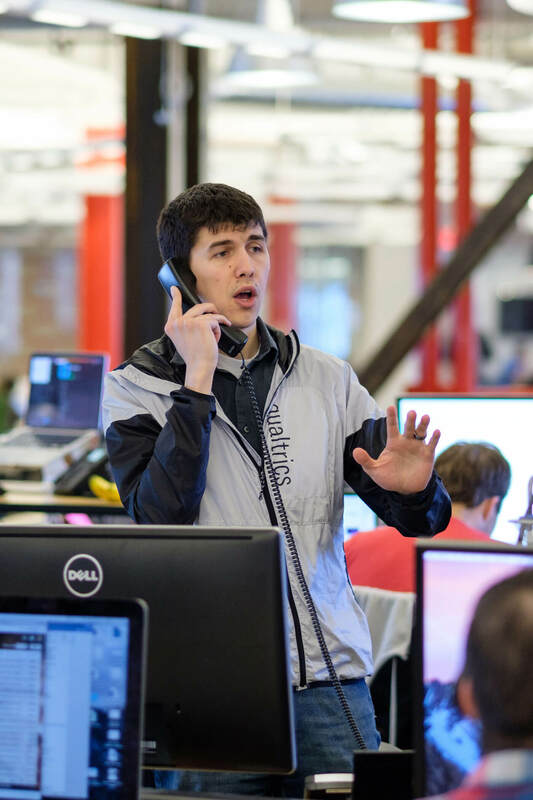 My plan was to become a physician, but that changed after one year at Qualtrics. I wanted a career that would provide me job security, a good income, regular client interaction, and the opportunity for continual growth. 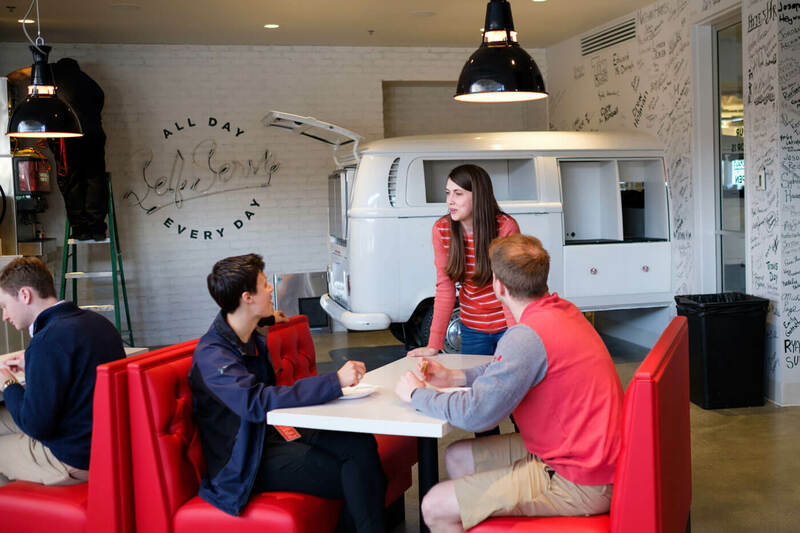 I was surprised how Qualtrics fulfilled all four. I’m engaging with a diverse set of clients and companies all day helping them address some of their greatest needs and I’ve been able to interact with some of the greatest market researchers. I’m learning new things every week and have the opportunity to promote every six months. Ashton: I’m a little atypical: I taught eighth grade with Teach for America for two years after college. That wasn’t for me long-term, but I didn’t know exactly what I wanted to do instead. 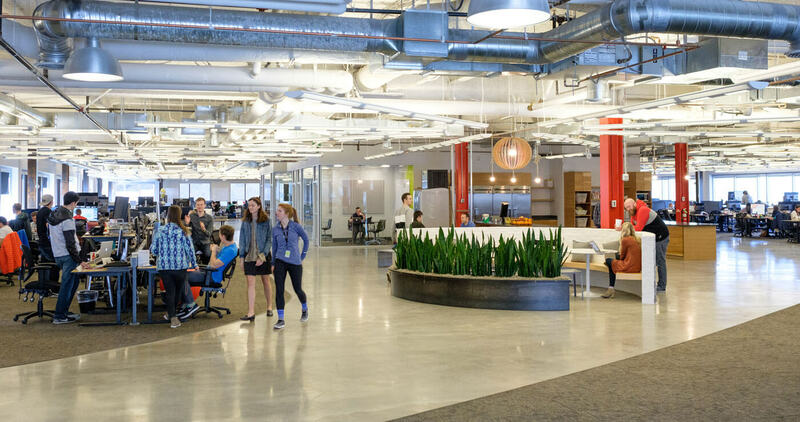 I applied to 25 companies all over the world, and Qualtrics had everything I was looking for: they exuded excellence, but they weren’t finished growing. I wanted to be part of a company that was still looking forward. Client calls are an important part of the team’s work. Was there anything surprising about working on this team? Ashton: Having never worked in sales before, I was initially afraid that I’d have someone hovering over me and telling me what to do. But I’ve found it’s the opposite here; I’m encouraged to be autonomous and I have a lot of control over what I do day to day. We’re definitely empowered to make decisions about our own book of business. The other hidden treasure is the fast pace; it’s a challenge, but it’s also such an opportunity. We definitely have goals we’re aiming to hit, but as we reach them, we’re already gearing up for the next deal. There’s no room to be lazy or complacent — this is a good role for someone who can think creatively about new possibilities, rather than working on set projects with definitive, neat conclusions. Ashton: You have to know your strengths and your weaknesses. Since I didn’t have much experience with sales or our product, I came in ready to learn. I was open to everyone’s advice, and I took the first few months to just soak it all in. We do a lot of mentoring here; an experienced team member was there for all my calls at first, even beyond what our training program requires. Ultimately, I learned so much that I think I was able to turn my lack of experience into an advantage. 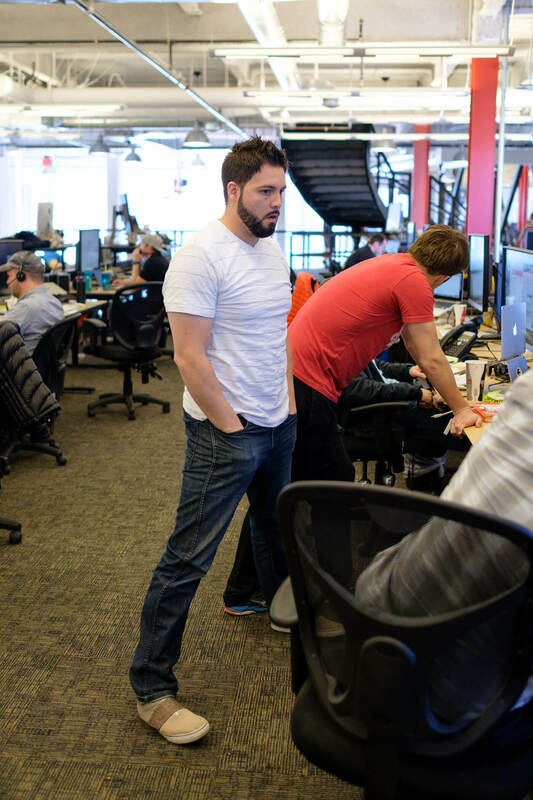 Dan: We also value loyalty, as well as long-term planning for both yourself and your team. That’s instilled in everyone who works here, and we talk with candidates about it. 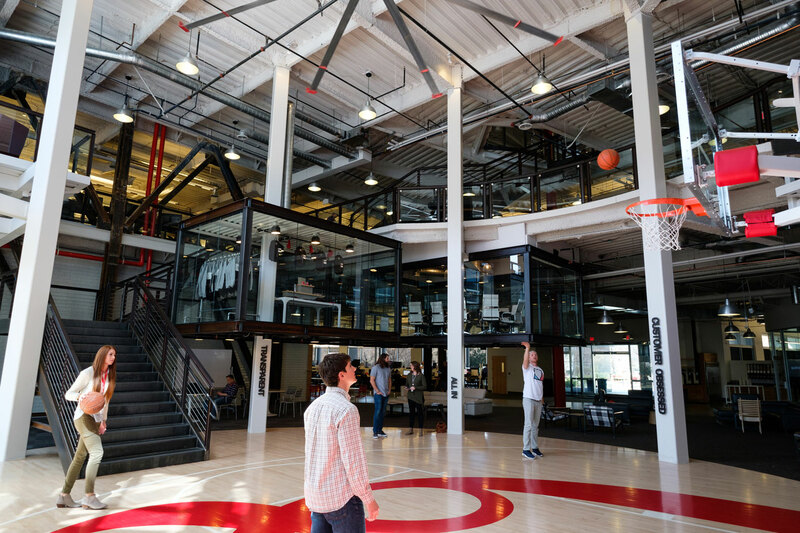 We might ask in an interview: Do you want to build your career here, or is Qualtrics just a stepping stone? Do you understand where we’re headed, and do you know how you want to contribute? Above: Lunch is catered Monday, Wednesday, and Friday. 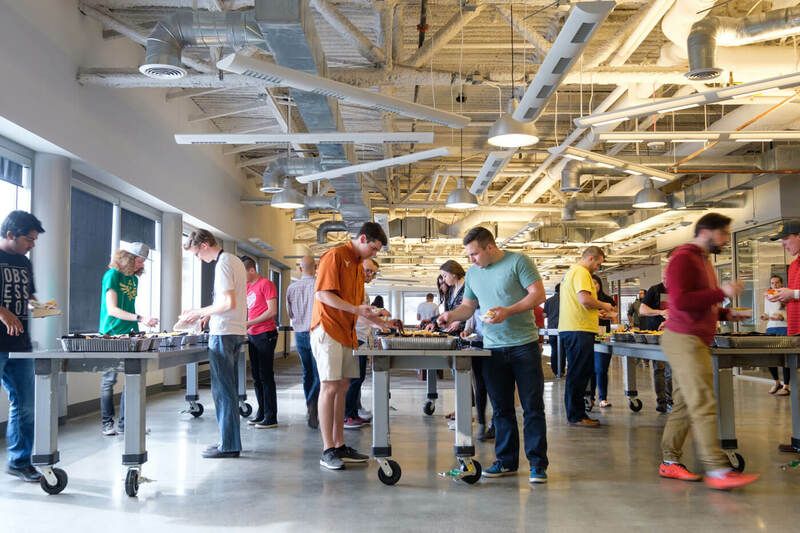 Below: Team members enjoy a variety of indoor and outdoor communal spaces. 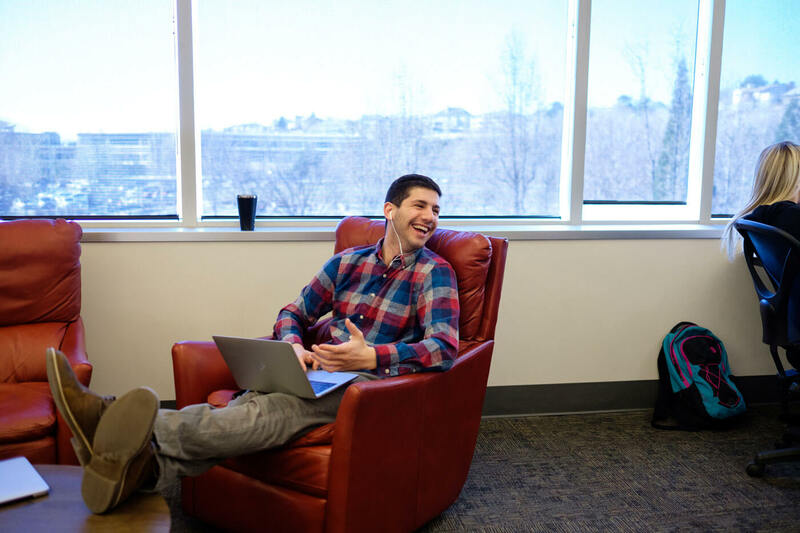 Garrett: I pride myself on being responsive to clients — and I think it’s one of the reasons they come back to me — but that can be challenging. It can mean addressing something over the weekend, and I’m always checking my emails. That’s my choice, though; if I didn’t want to climb as quickly, I could set client expectations for a different pace. Nancy: I will admit that it can sometimes be tough to keep going after a project falls through, or a particularly negative response from a prospect. I’ve probably sprouted a few new gray hairs since I started. But I think we all appreciate the challenge; it builds character and helps us learn. Garrett: It can also be difficult to be realistic about your progress. When you first get here, you see people working at a higher level and think, “Will my time ever come?” You have to be patient, because that learning curve is so important. It helps to see that the people you’re watching went through the same training and growing pains — literally. Because Qualtrics is so transparent, we can look up what anyone at the company billed each quarter. That helps keep things in perspective and reminds us all of their growth rate. How does compensation work, and what are your opportunities for growth? Dan: We work on a 50/50 model: 50 percent base pay, and 50 percent variable, with a bit more base when you’re brand new. The variable pay is tied to profit. Since we’re working with partners, we pay careful attention to their margins and we incentivize reps to improve them. We also have overall quotas, but those aren’t tied to profit. Nancy: We also measure our actual activity: the calls we make, the meetings we hold, the opportunities we create. It’s important to think about all of that, in addition to what you’re billing. You want to be building a long-term pipeline and developing your skills for future deals, not just focusing on short-term success. 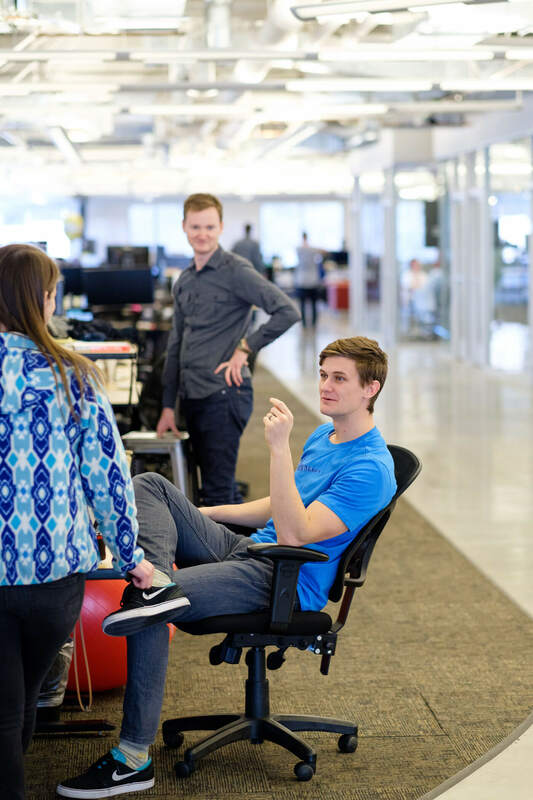 Dan: As for promotions, that process is very transparent and data-driven at Qualtrics. We are clear about what it takes to move up, and it’s up to you to hit certain milestones to get there. 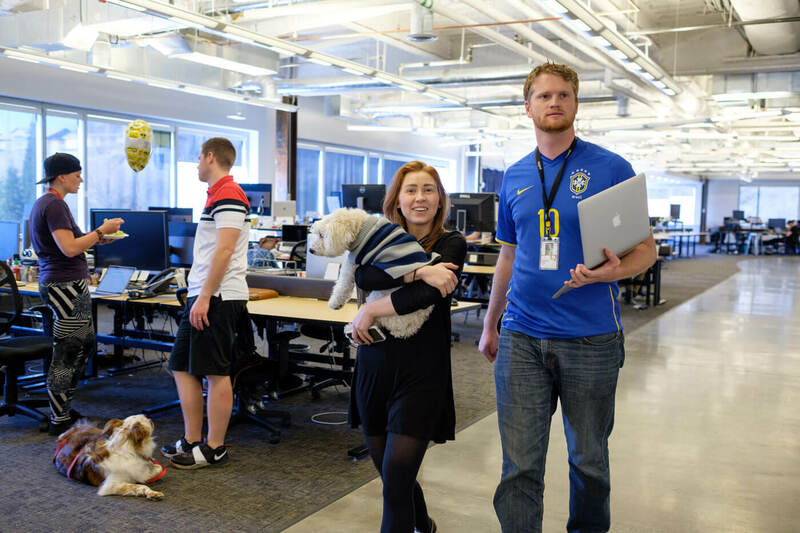 Broadly, you can choose an individual contributor path where you keep making more money and working on larger accounts, or a leadership path where you’re becoming a team lead and on from there. Either way, you’re choosing your next step, it’s not being dictated by anyone else. 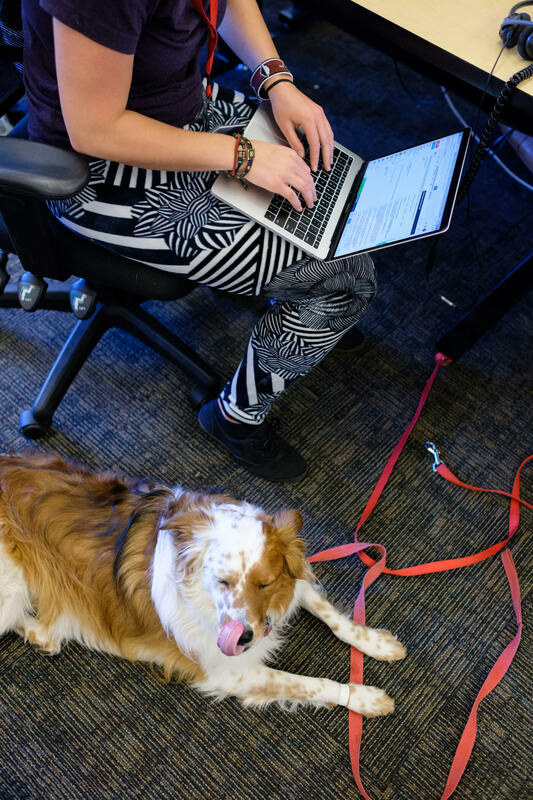 Above: Furry office friend, or attentive project manager? 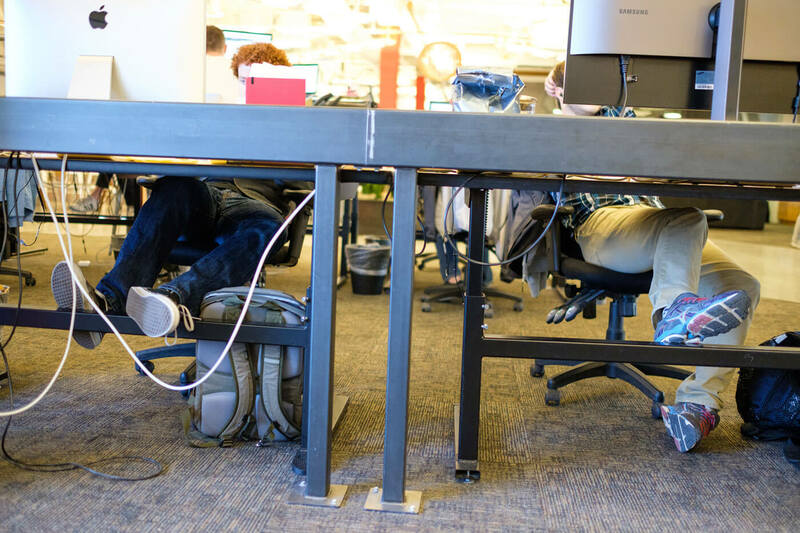 Above and below: Team members take advantage of a plethora of comfy workspaces. Business on the screen, casual under the desk. 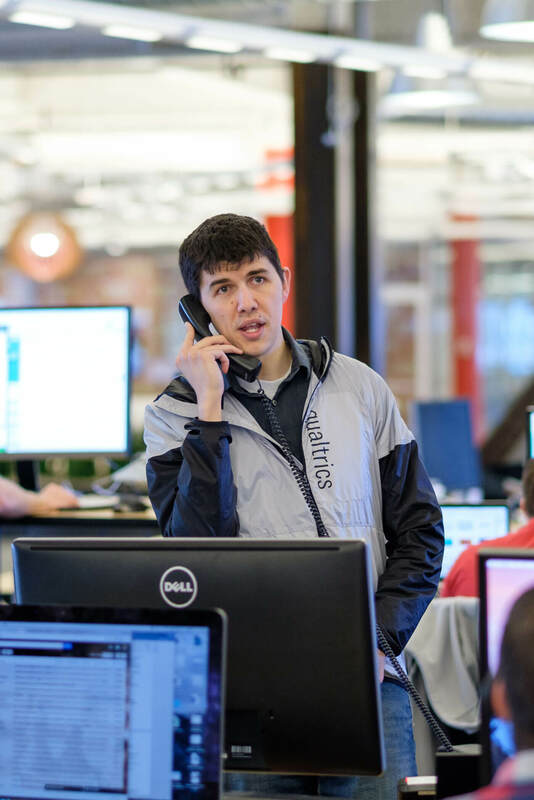 Can you talk about the resources Qualtrics gives you to support that growth? Dan: Supporting each other starts on day one. 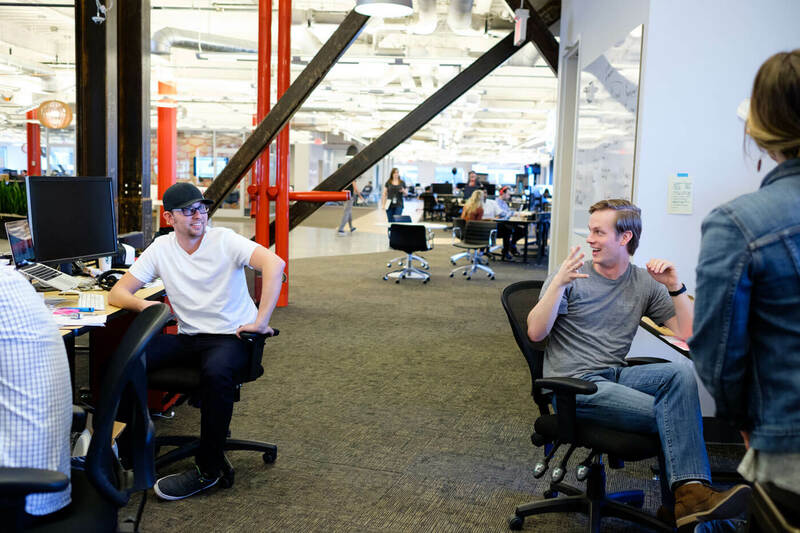 Everyone is assigned multiple mentors, and as soon as you’ve hit your first quota, you can raise your hand to help mentor other team members. Ashton: I’m actually mentoring someone who only started a month after me, which is humbling. I’ve probably learned just as much as she has. Instead of me giving her instruction in some formal way, we sit in on each other’s calls and kind of tackle things together. It’s a different style of leadership for me, and I’m still getting used to it, but I’m already seeing how it helps me do my job better. Dan: Qualtrics is great at recognizing potential. I was 22 years old when I started leading a team, and I want to enable every single person here to have the same opportunity, or better. That’s why it’s so important that our mentorship program is a community effort. You can learn from your manager as well as from someone like Ashton who is newer to the role but eager to help new employees as part of her own development. For me personally, there came a time when the high of closing a new deal started to fade. I found that my priorities shifted so I was more focused on sharing what I’d learned and building up people who are the future of the company. Every leader who reports to me has specific goals for every employee working on their team, and a plan to measure and support their growth. And we do a lot to celebrate that growth, but we also do things just for fun. I took the entry level employees to Vegas last weekend. Anyone at Level 1 or Level 2 could go, and I covered their housing, one of their meals, and then we all went to David Copperfield. I remember how it was to just be starting out and not have much money left over for trips like that. And I really do believe in a family kind of culture where you actually want to spend time with people, and see them in an environment that’s completely different from work. 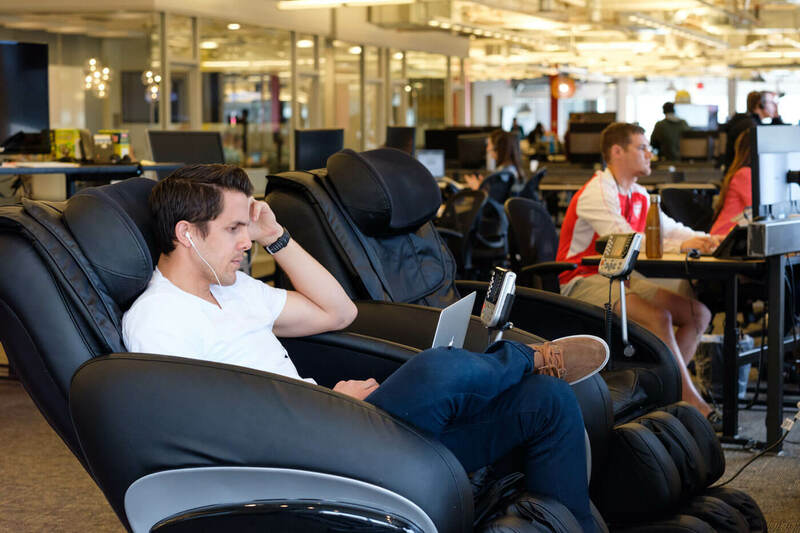 Above and below: Afternoons are for client calls, one-on-ones, and team collaboration. What have you learned since joining this team? Nancy: I’ve learned a lot about being persistent. You have to come in with set goals when you’re working in sales, because at the end of the day we’re accountable for a quota. Working on this team has taught me how to come in every day with my head held high, no matter how things went the day before. 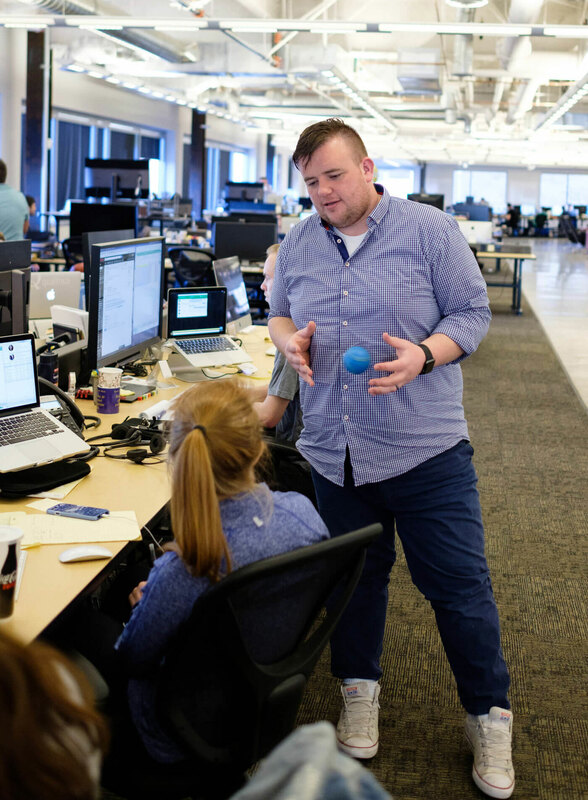 Garrett: I didn’t come in with a background in market research, and one of the things that excited me about this job is how it educates us by immersion. We’re playing an active role in designing and executing these studies, and because the platform is relevant to so many kinds of businesses, we’re working in a wide variety of industries. I’m launching about 10 different projects per week, if not more, with clients ranging from mom and pop shops to big pharmaceutical companies and social media sites. 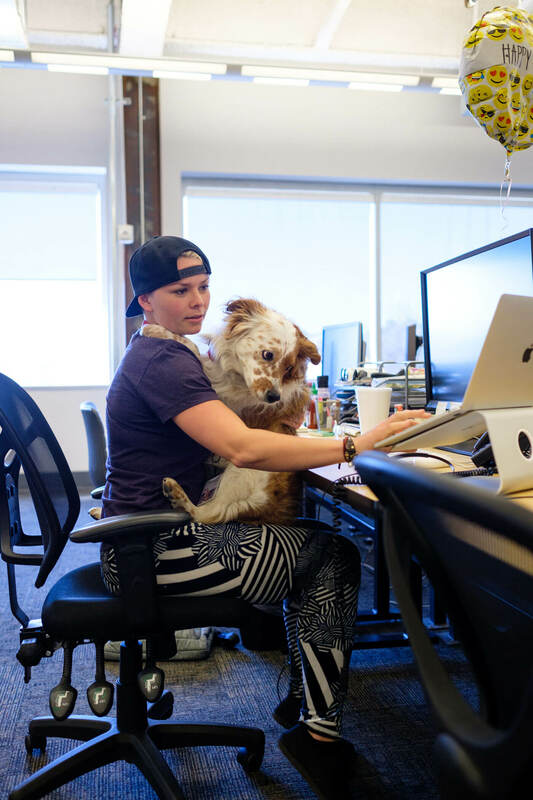 So we’re learning things that can help us grow our careers, whether we stay at Qualtrics or not. Dan: We’re also always learning from each other; diversity of thought is important to the company and we’re proud to encourage it on this team. 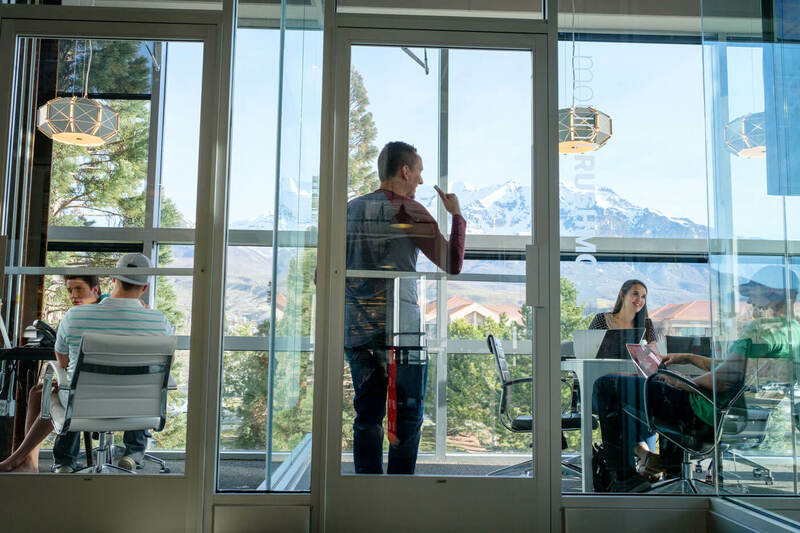 We have clients all over the world, and we also have employees coming to Qualtrics from lots of different places, which is part of what makes Qualtrics a special place. I believe some of the most impressive people this world has to offer work right here in this office. It’s rare for a day to go by when I haven’t learned something new from the people around me.